By purchasing Cup Holder Heros® you'll add a vibrant splash of color to your interior and make cleaning your car a breeze! If you spill or get crumbs in any compartment simply remove them and wash them in the sink! This is one kit of 15 custom fit mats for your new car! 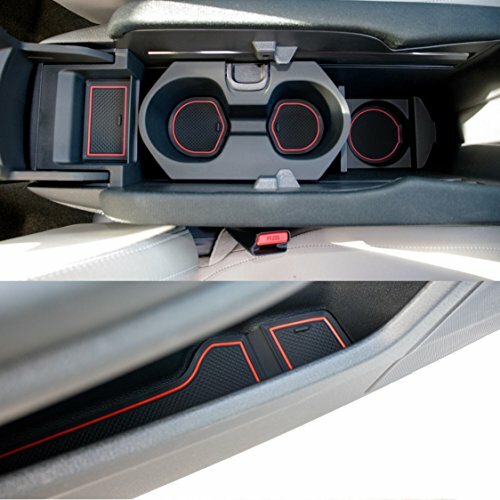 They fit all 10th generation Honda Civic's (2016, 2017, 2018, 2019) The mats cover areas in the front seat of the car only. Rear set is sold separately depending on the body style. Cleaning: To clean the mats carefully use the convenient pull tab and remove them from the car. You can then shake them out, and if needed wash them with warm soapy water. Curled Mats: During shipping mats may get slightly bent and not sit flat in the compartment. (less than 1% of orders should see this problem) They usually fix themselves over 1-2 weeks by being in a hot car. If you are in a cold climate you may need to use a hair dryer, wash the mat with hot water, or place them on your dashboard in the sun and to fix the curling.